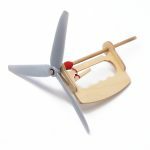 This new issue of balsabuilder Magazine kicks off a series of technical articles that builds upon the basics presented in issues 1-4 and delves into CNC for the hobbyist. Issue 5 features three exciting builds that are suitable for any skill level. Those who opted for our full delivery will see their magazine accompanied with full size plans for each of the build projects. 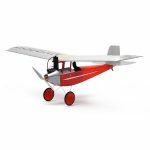 Featured full-size plans: Puddle Jumper weekend project | EZ Piet – Electric Sky Scout | BuildIt! Draftdraft Dust Table. balsabuilder returns to your mail box in 2017 with all new Issue 5. 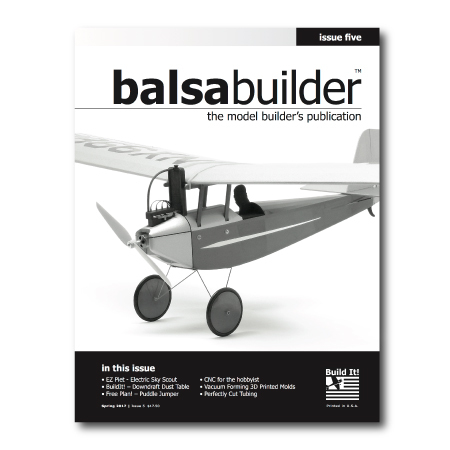 This new issue of balsabuilder Magazine kicks off a series of technical articles that builds upon the basics presented in issues 1-4 and delves into CNC for the hobbyist. 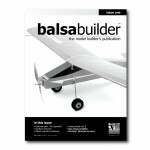 Issue 5 of balsabuilder features three exciting builds that are suitable for any skill level. Those who opted for our full delivery will see their magazine accompanied with full size plans for each of the build projects. EZ plug wires add scale realism to your sport model.